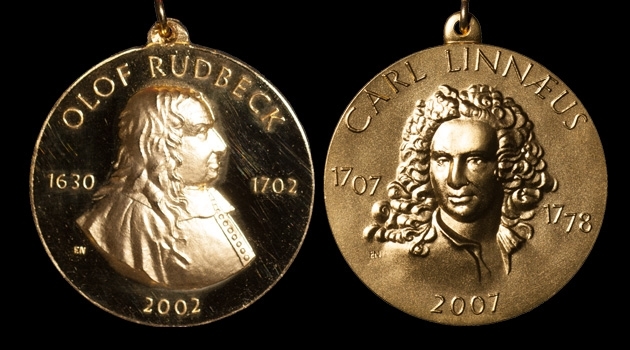 Uppsala University’s Rudbeck and Linnaeus medals. This year’s Rudbeck Medal goes to professors Sverker Gustavsson, Lena Kjellén and Peter Stoica, and the Linnaeus Medal to Professor Hans Ellegren. The medals will be awarded at the Winter Conferment Ceremony on 27 January 2017. The Linnaeus Medal is awarded to Hans Ellegren, Professor of Evolutionary Biology at the Department of Ecology and Genetics, Uppsala University. Hans Ellegren is awarded for his studies of evolutionary processes which govern the development of life. How do new species arise? What is the genetic background to the barriers that stop some closely related species from reproducing with each other? Ellegren has among other things mapped the whole genome of two different species of flycatchers to answer these questions. His findings have had a large international impact and they are published in the most prestigious scientific journals. The Rudbeck Medal is awarded to Sverker Gustavsson, Professor Emeritus of Government at the Department of Government; to Lena Kjellén, Professor of Medical Glycobiology at the Department of Medical Biochemistry and Microbiology; and to Peter Stoica, Professor of Systems Modelling at the Department of Information Technology. Sverker Gustavsson has over his long career brought attention to issues of legislative and administrative policy. He has studied how public sector services have been Europeanised and professionalised, with a basis in what respectively furthers and undermines democracy. Gustavsson has developed a political science that is down to earth, analysing and discussing every-day political issues in a way that clarifies political differences and considerations, not least regarding EU and higher education policy. Gustavsson has tirelessly defended academic freedom and in his reasoning for academic liberalism he clearly formulates why universities should be governed by principles of collegiality. Lena Kjellén, since several years, conducts very successful research on the biology of complex carbohydrates. This has led to a basic understanding of normal foetal development but also of the mechanisms behind skeletal and muscular diseases, among others. Peter Stoica is a master of using theoretical models to describe the spectral properties of signals. His broad interests include topics such as wireless communication, microwave imaging to identify breast cancer, radar signal processing, and signals from landmines, to name a few. Stoica is one of the world’s most cited researchers in the field of engineering sciences and has contributed important basic literature used in our Bachelor’s programmes. The medals will be awarded at the Conferment Ceremony on 27 January 2017.